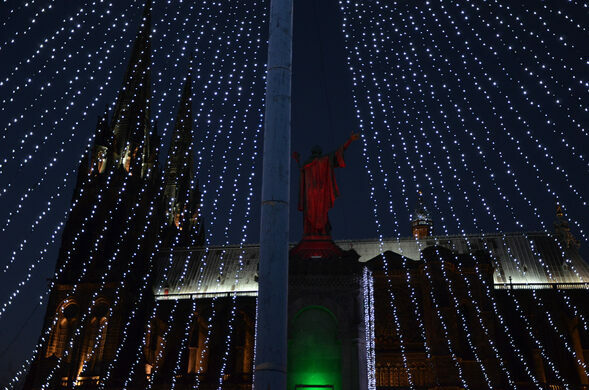 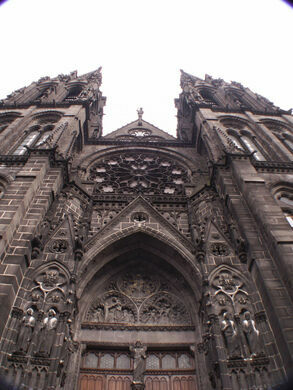 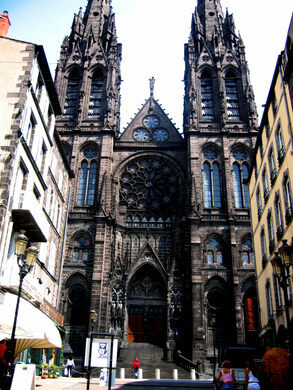 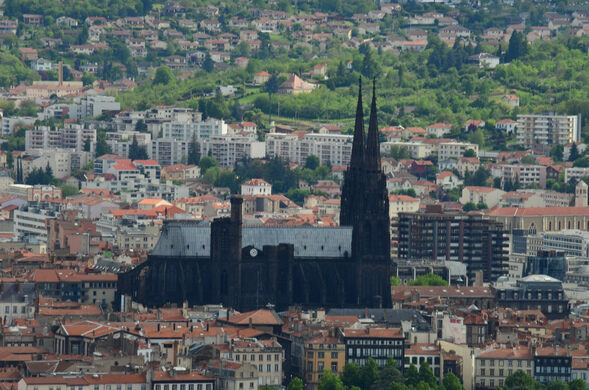 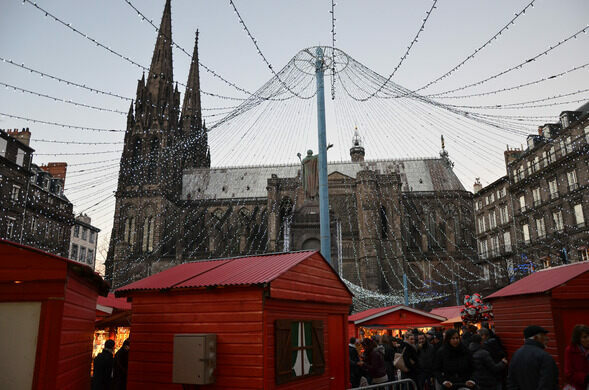 Constructed entirely from black lava rocks, the Cathédrale Notre-Dame-de-l’Assomption in Clermont-Ferrand looms ominously on a hill in the center of the French town. 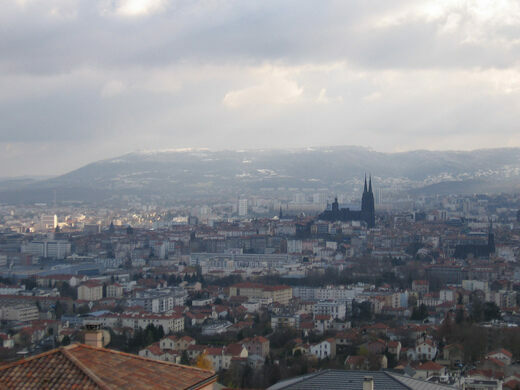 The largest chain of dormant volcanoes in Europe surrounds Clermont-Ferrand, and many of its old buildings were built from the volcanic stones. 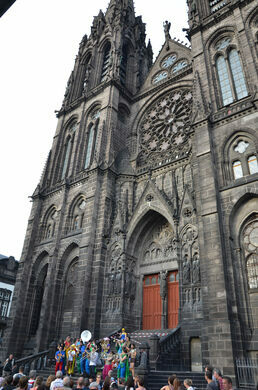 The Gothic cathedral is the third Christian church to be erected on the spot, and remnants of the previous structures, including a crypt from the 10th century, were incorporated into its foundation. 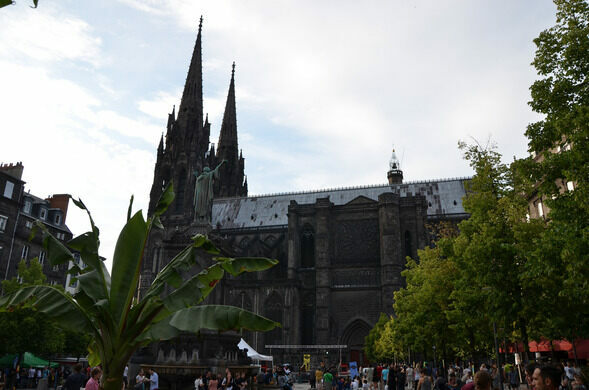 Construction on the cathedral began in 1248, but interruptions by the Hundred Years’ War and French Revolution did not allow for its completion until 1902. 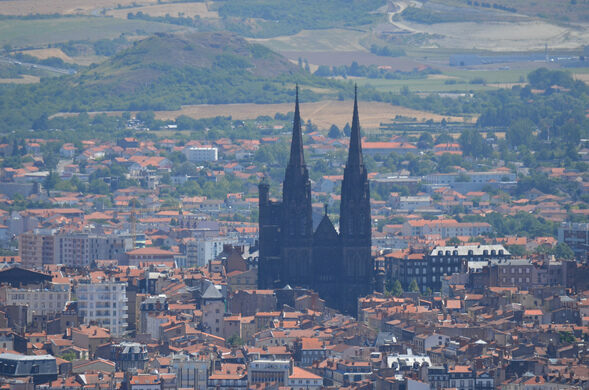 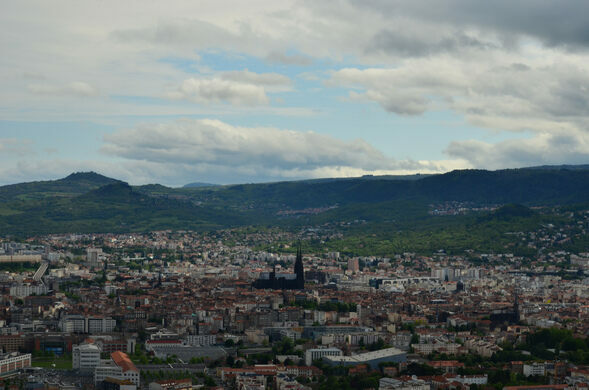 The cathedral and the town are dominated by its twin spires, which soar to 108 meters and face the Puy-de-Dôme, the largest of the neighboring dormant volcanoes. 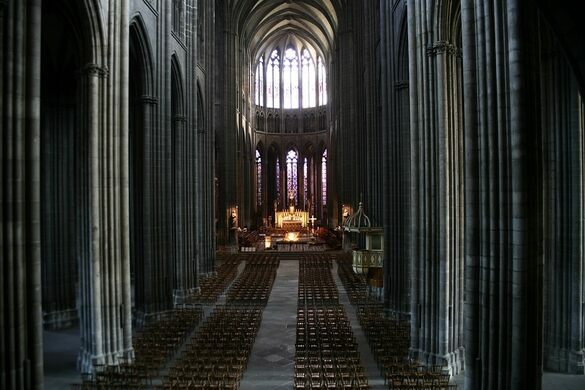 Light filters into the cathedral through 13th and 14th century stained glass windows of saints and their martyrdoms, but the dark stone columns still make the nave a somber and shadowy place. 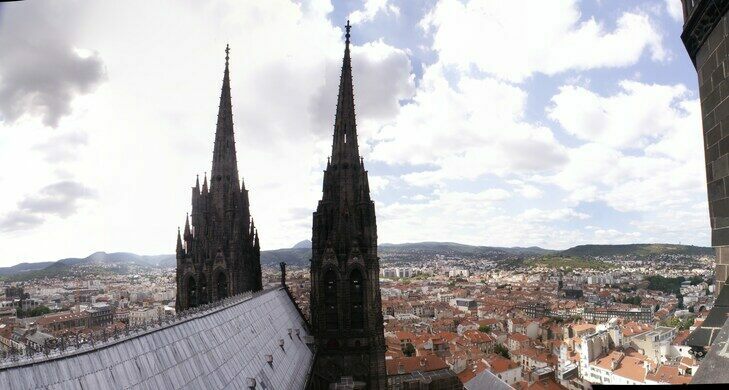 The stone ceiling reaches to 30 meters and a 16th century clock is sounded by automatons of Mars and Faunus beating the elderly head of Time. 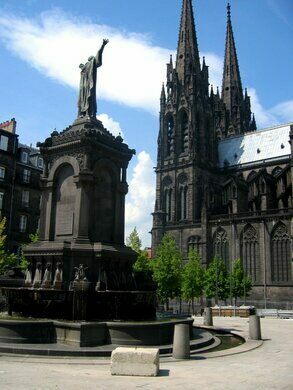 Outside, gargoyles pour water from their open mouths when storms pass over Clermont-Ferrand and the adjacent Place de la Victoire holds a statue of Pope Urban II, who launched the first crusade from Clermont-Ferrand in 1095. 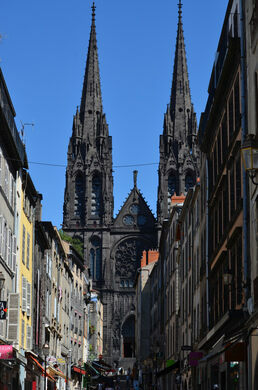 Walk uphill from the train station. 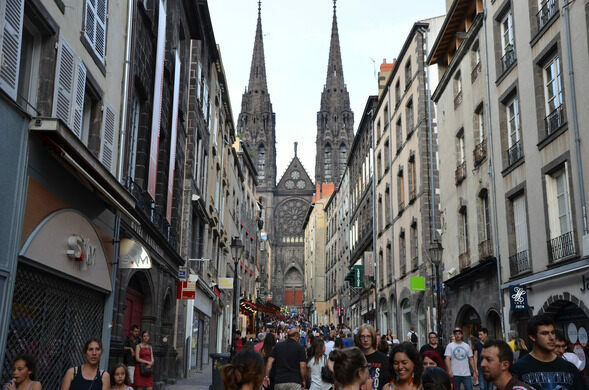 FlyKiss fly from Luton to Clermont Ferrand. 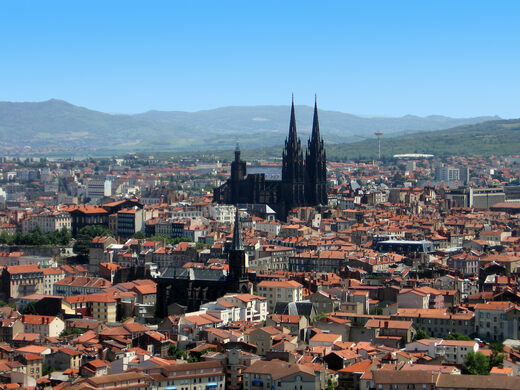 A cave dwelling that was started by the Celts, expanded by monks, and finished by knights.